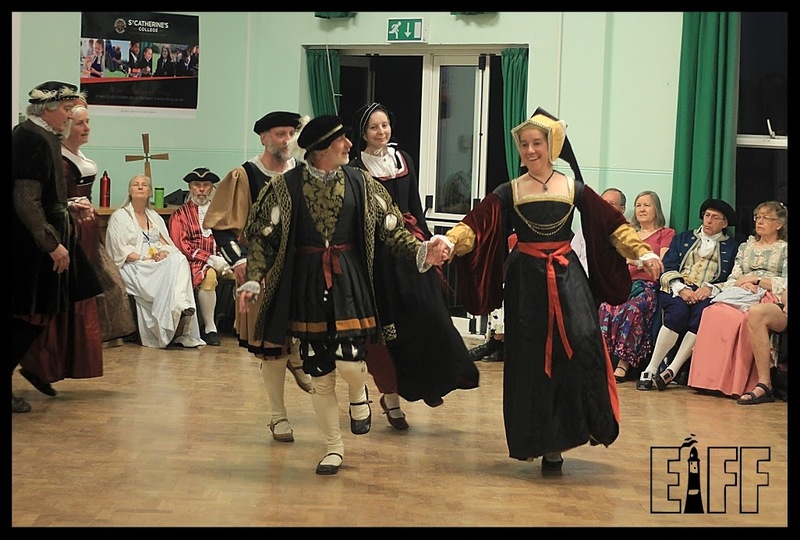 The Early Dance Circle sponsored a group of early musicians to accompany Renaissance Footnotes to Eastbourne as a way to reach out again to fellow dancers who might not know about the EDC and the historical roots of traditional dancing. On this visit, 15th century dance was the focus, with all its variety from the grand to the downright playful. We sent information about the dances of various periods, where to find classes and the timing and the location of upcoming events. 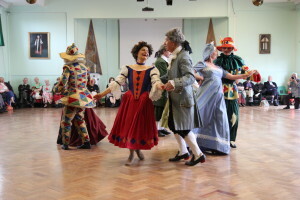 The classes and performances were well attended and considerable interest was shown. The Early Dance Circle collaborated in this celebration held at Sands Film Studios, Rotherhithe, 23 to 25 February 2018. 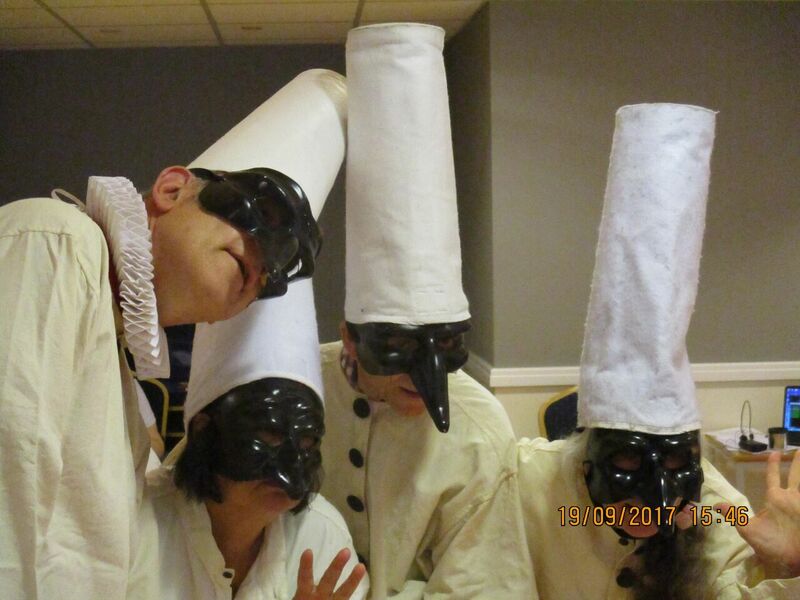 Commedia dell’arte Day is celebrated every February 25 with performances, lectures, conferences, classes, and other events occurring in cities all over the world. The 25 February was chosen as it is the “birthday” of Commedia dell’arte and of professional theatre. On February 25, 1545, a troupe under the leadership of Ser Maphio signed the first contract of theatrical incorporation in Padua, Italy. The document, drawn up by a local notary, is the oldest extant documentation of actors conceiving of their work as a legitimate industry. 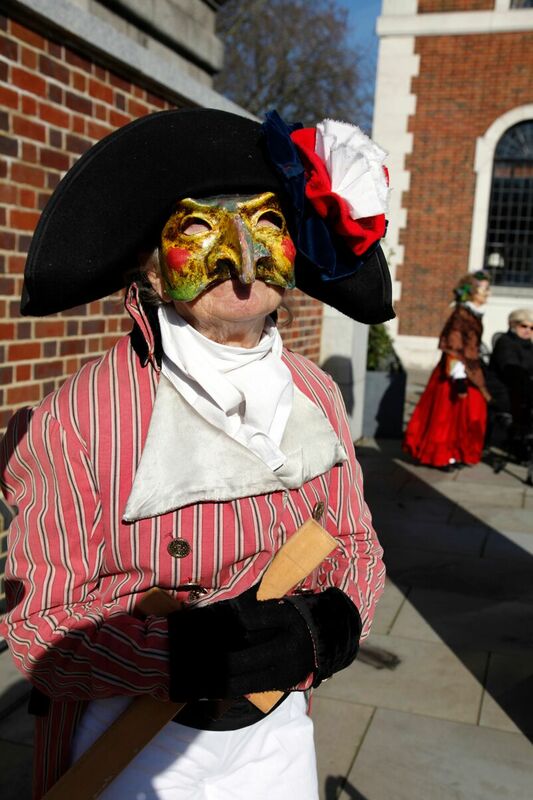 Commedia dell’arte day is proclaimed by the European cultural association SAT, which is recognized by the United Nations as the world’s only NGO dedicated to safeguarding and promoting the tradition of Commedia dell’arte. Events are being planned all over the world. Faction of Fools Theatre Company, based in Washington, DC, is the International Coordinator of those events. Expert speakers discussed the role and influence of the lute as an instrument to accompany dance in the 15th century. 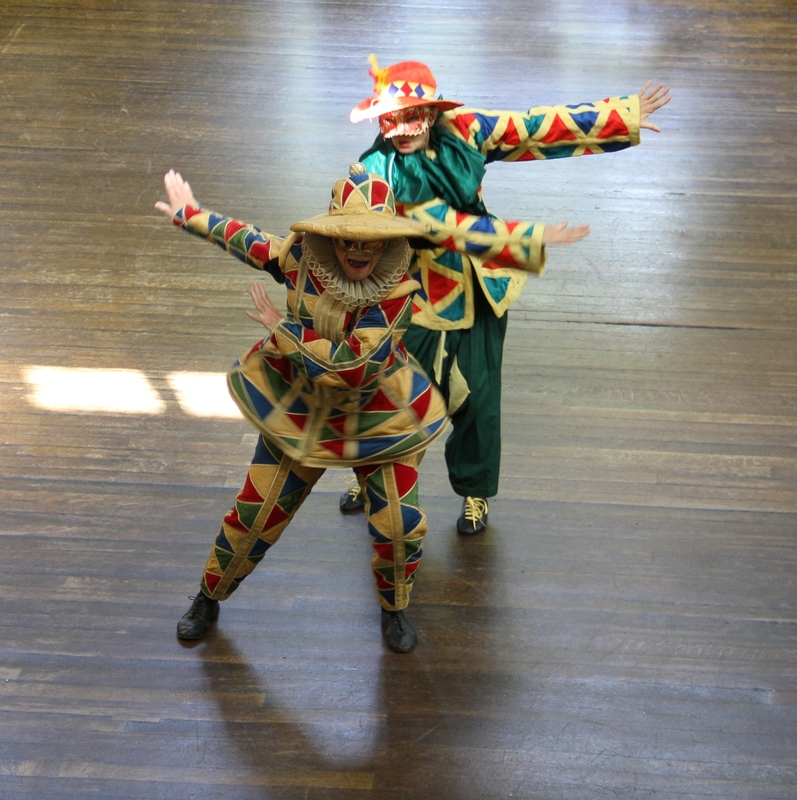 The event included live music demonstrations, a dance workshop with Hazel Dennison, a dance display and recital by Renaissance Footnotes, Hazel Dennison, Barbara Segal & Friends, with music from Matthew Spring (lute) & others. A video record of this day can be found at our YouTube channel here: https://www.youtube.com/channel/UCTSRkUZSDO9ZESOh_Y_zrJA . It was an interdisciplinary study event for both dancers & musicians, working together. 4 musicians from Passamezzo and 10 dancers from Renaissance Footnotes brought early dance to thousands of festival-goers. With the help of EDC, they attended the Frydek-Mistek 21st International Folk Festival, part of the annual programme of Unesco Partner, CIOFF (the International Council of Organizations of Folklore Festivals and Folk Arts). 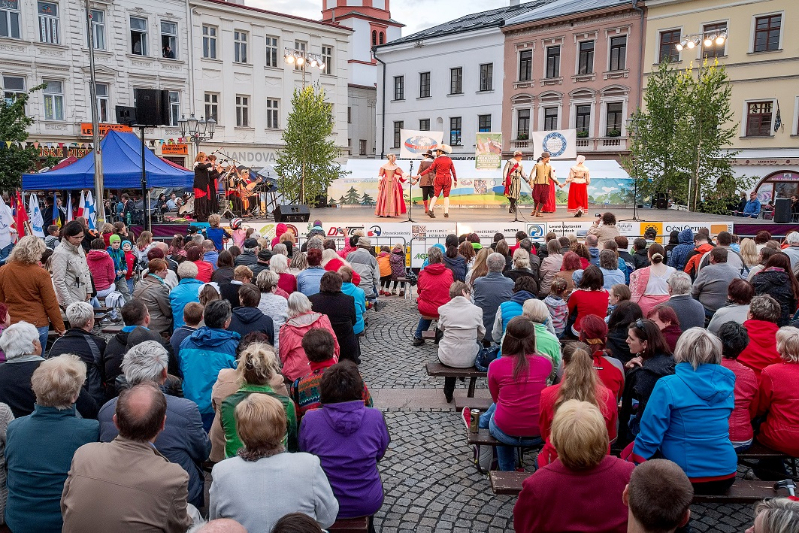 Many European dance festivals draw huge crowds and this was no exception. The Early Dance Circle helped sponsor the venture, with 580 participants danced their way through 35 timetabled events, including 26 concerts/performances over what must have been an exhilarating, if exhausting, week. Everyone attending received one of our fliers. Robert Huggett taught Sellenger’s Round, Pease Bransle and Queen’s Almain to classes of 100 at a time, reaching out to many who had never before heard of early dance. His group danced at a concert for schools that played to 1000 and their 3 performances in the main town square were attended by 1000 to 2000 appreciative spectators. Oh, what we would give for such enthusiasm in the UK! The leader of one of the groups will be attending classes with Renaissance Footnotes in the UK next year and others too showed a keen interest in how to research early dances. Our thanks to Robert and his group, as well as to Passamezzo, for taking part and for publicising the work of the Early Dance Circle and early dance itself among both dancers taking part and the large audiences who so much enjoyed their performances. The Early Dance Circle sponsored Contretemps’ appearance at Eastbourne as a way to reach out to fellow dancers who might not know about our website and what we do. We took information about the dances of various periods, where to find classes and the timing and the location of upcoming events. Our visit was very well received indeed. 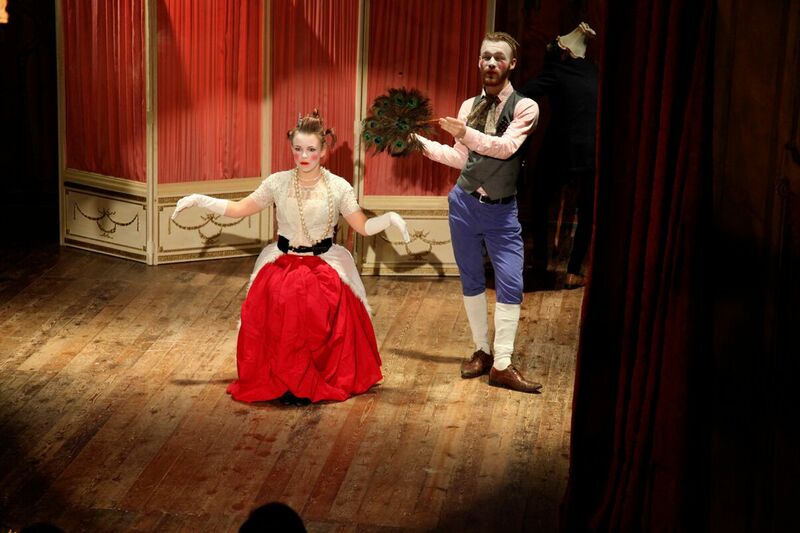 Big Dance Week – participation in London and across the UK in collaboration with the Dolmetsch Historical Dance Society. A week of free evening classes and demonstrations culminated in a Grand Concert and Regency Dance at Charlton House, Greenwich, London, who helped sponsor the event by donating the venue. Once again, groups all over the UK developed and ran their own programmes during Big Dance Week. 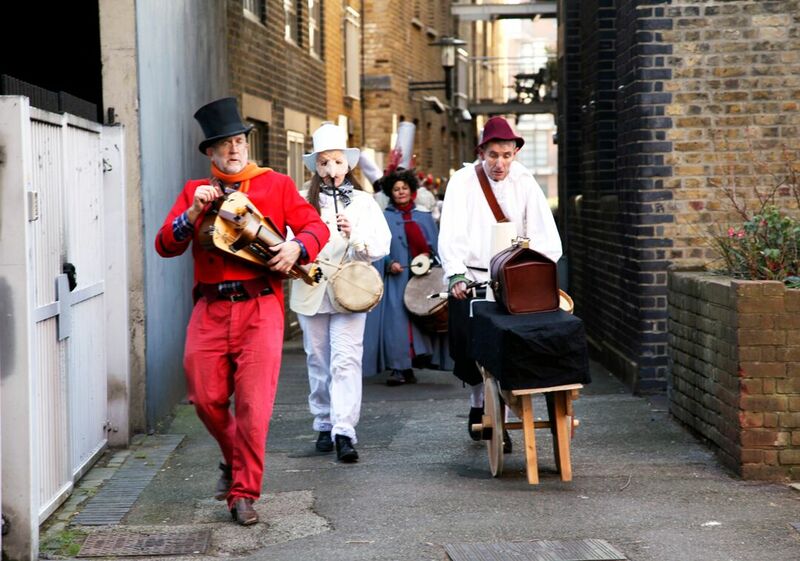 Collaboration with Big Dance and the Arts Council allowed us to raise the profile of early dance at a number of events across London and the country. 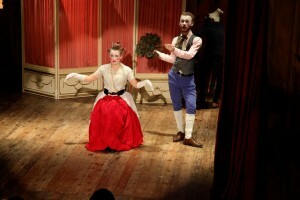 An Early Dance Show in period dress, with music on period instruments and words from period texts. Forty dances were performed by a troupe of 70 dancers, drawn from 13 dance groups, with 21 musicians.